Efforts by workers’ rights groups to spread the word about New York’s Domestic Workers Bill of Rights have resulted in a big uptick in grievances filed against household employers. Advocacy groups are actively canvassing New York City neighborhoods – in playgrounds and grocery stores and other places where nannies and other household employees are likely to go - to educate these workers about their rights. Last month, Domestic Workers United (an in-home caregivers’ advocacy group) set up a telephone hotline to reach larger numbers of domestic workers and made it easier for them to lodge a complaint. If a household employee contacts the hotline with a question about past wages or unpaid overtime, she is referred to a legal clinic run by the Urban Justice Center to help file a Wage and Hour grievance. According to Slate.com, the NY State Department of Labor is prioritizing these claims. “The uptick of attention to domestic workers’ cases … has already resulted in dozens of domestic workers collecting awards of back pay and penalties ranging from $5,000 to $100,000”. In fact, about 75% of complaints filed have resulted in financial settlements. DWU reports that the US DOL investigated 80 claims in the first year, resulting in $250,000 in settlements. 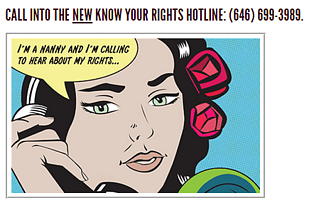 As a New York household employer, are you familiar with the Domestic Workers Bill of Rights? While advocacy groups are educating nannies and other household employees, New York household employers are often unaware of their specific responsibilities under the law. And as the employer, the burden of proof in any dispute falls on you. Are you aware that a live-in domestic worker is entitled to overtime (1.5 x hourly rate) if they work more than 44 hours per week? The nanny that comes-and-goes is entitled to overtime after 40 hours in the work week. Did you know you must pay your household employee on a weekly basis? You are welcome to download Homework Solutions’ free tip sheet where you can learn all of the requirements for a New York household employer. You are always welcome to call the Nanny Tax experts at HomeWork Solutions to discuss your specific situation weekdays at 800.626.4829.